by Jerald Simon on October 9, 2017 in Blog, Motivation in a Minute! Too often we can get caught up with ourselves. I’m as guilty as anyone. We tend to feel we are at the center of our own universe, but if we place ourselves there and expect everyone else to revolve around us, we create a disparaging and life-battling barricade between perception and reality. The reality is that we are not the center of anything. In fact, the opposite is the case. We can often worry that others are mistrusting us, speaking ill of us, judging or comparing us, or doing a hundred different and equally detrimental deeds to or about us. The truth is others are worried about themselves and their own daily to-do lists and challenges. They may be doing things out of fear and insecurity and not out of animosity or hostility as we might think. We must help others be their best just as we must help ourselves be our best. 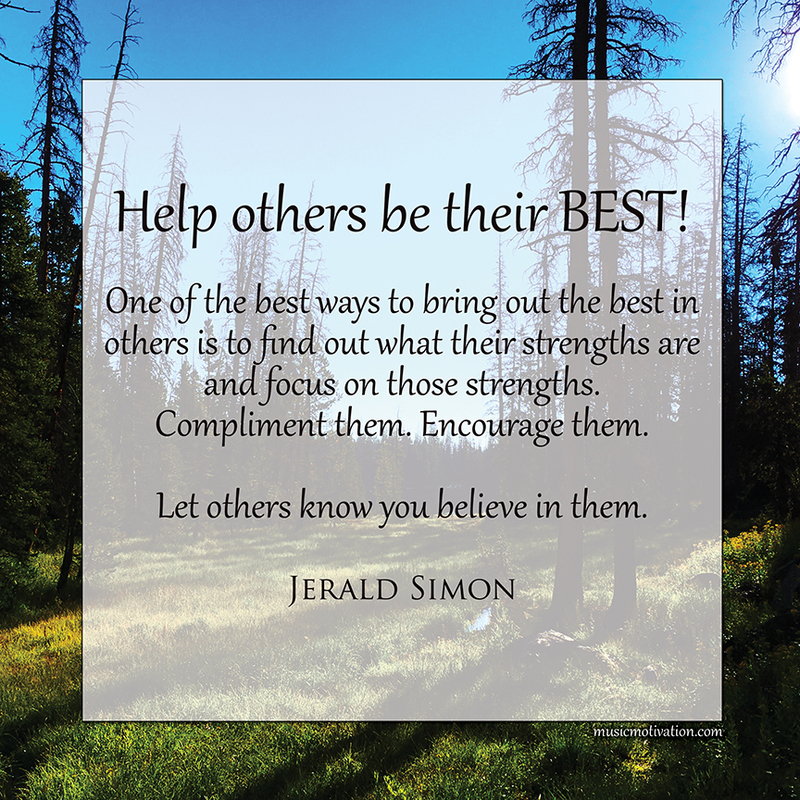 How do we bring out the best in others? One of the best ways to bring out the best in others is to find out what their strengths are and focus on those strengths. Compliment them. Encourage them. Let others know you believe in them. Every individual can do better and be better if they want to. Our responsibility is to let others know we love them, we trust them, and we want them to be happy and experience all the good bounteous blessings that life has to offer. It is a gift we have been given to bless the lives of others. Some may call this motivation – whether for ourselves or in an effort to motivate and inspire others. That is true, but what we are really talking about is listening to those around us, being aware of their hopes, dreams, and seeing that sparkle in their eyes that makes them come alive. It is about discovering for ourselves who we are and helping others discover who they are. It is a life long pursuit and an enjoyable and sometimes endurable endeavor. We are all working together to help each other experience a little bit of heaven here on earth. We must build each other up and help each other improve. It is not about taking sides or trying to outdo each other or compete against each other. Competition in business can be good, and competitors can help everyone build better businesses and produce better products, services, and overall customer experience. But that does not mean we as individuals or businesses must tear others down to build ourselves up. Everyone can succeed. There is more than enough business for everyone if they have identified their customer niche and if they continually work on improving their business. This is as true with neighbors, friends, family, and acquaintances as it is in business. We all can work on improving ourselves and each other.